I found a few tutorials to do this, many of them point to using the jslink or content editor. 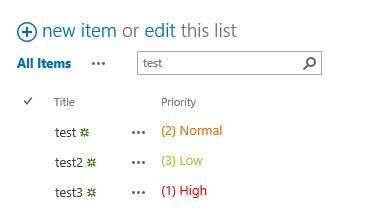 I tried following the instructions in this site: CSR code samples #1 (Task Priority color) but it's not working for me. I created a new list with the column called Priority, uploaded the js file into _catalogs/masterpage/displaytemplates and put the url (~site/_catalogs/masterpage/Display Templates/Text_Colour.js) into the JS Link field. Is there any changes I need to make for this to work as expected? I also tried added this script to the Script Editor web part and instead of running the script, it shows the text. Is there something I need to add or setting I need to change to make this work? Add the following code into script editor web part in list view page. Or save your code into a js file(colorField.js) and upload the file into Site Assets document library. And then use the JSLINK url below into the list view web part.